Molyneux Paris has launched Quartz Je T'aime, a new flanker to 1978's Molyneux Quartz. Molyneux Paris presents its new creation, a fresh and feminine Eau de parfum for all women who love French elegance and the whirlwind of Parisian life. Decisively impertinent, Quartz je t’aime is the signature of a modern saga. An invitation to live, laugh and love. Ca c’est Paris! This adventure begins with the sparkling charm of joyful, sun-drenched tangerine, then unfurls with the modern floral notes of rose and lily. Musk and vanilla exalt this appealingly delicious fragrance. 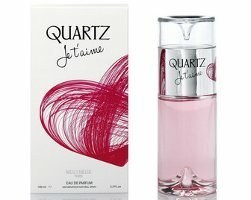 Molyneux Quartz J'Taime is available in 30, 50 and 100 ml Eau de Parfum. Sounds kinda pretty. Wonder if it will be available in the U.S.? This flanker has been a long time arriving! Ha, that is true, but it is not the first by any means — only the latest. Very true! I think their license changed hands.